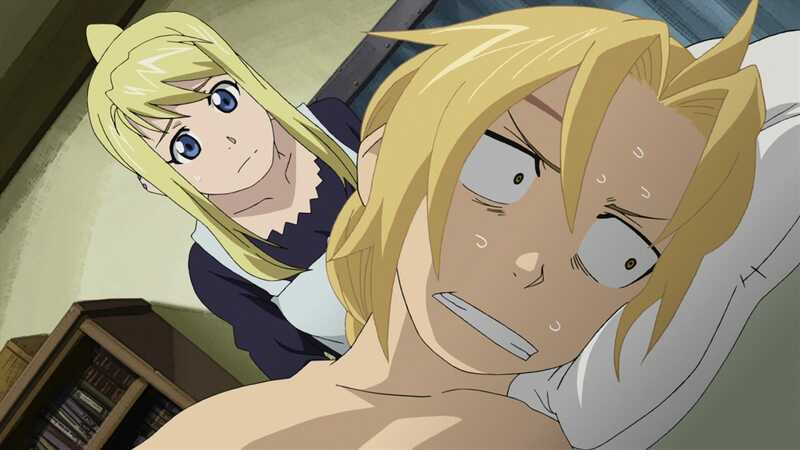 Winry fixes up Ed’s automail before Kimblee talks with him, ordering his men to keep Al separated from him. Olivier sends a search party down the tunnels, who find a couple of survivors warning them not to put any lights on. Riza learns that Bradley’s son, Selim, is a homunculus named Pride who attacks from the shadows. Kimblee orders Ed to search for Scar and Marcoh and create a bloody crest similar to Ishbal in Briggs, tempting him with a Philosopher’s Stone if he accepts. After telling Al and Winry all about it, he grudgingly accepts the job, though doesn’t intend to use the stone himself. As Ed and Al go to search for Scar, their real intent to find May as well, Winry decides to accompany them.